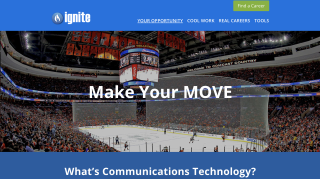 The NSCA Education Foundation has launched an online portal to attract and retain talent in the communications technology industry—igniteyourcareer.com. Currently, lack of awareness among up-and-coming students and young professionals means that great jobs in the industry go unfilled. Graduating students aren’t aware of the promising and lucrative careers available in communications technology. Ignite brings together students, graduates, educators, and employers to cultivate a new generation of leaders in fields ranging from AV and communications to security, life safety, and IT/networking. The Ignite portal is an interface for students who want to explore the communications industry—and industry organizations that want to network and interact with these students. Defining the industry and revealing the many career opportunities available, the site also shows off cool technology projects through graphics, images, and videos. The portal also features a free job board where NSCA members can post unlimited open positions for students. Integrators and manufacturers can also find the following resources on the portal: mentorship and internship toolkits and best practice guidelines; scholarship information; student success stories; an Industry/Educator Ambassador Locator, which pinpoints organizations that participate in Ignite and educational institutions that offer relevant industry degrees and/or certifications; and information about becoming an Ignite Ambassador. To learn more, visit the new portal at igniteyourcareer.org.